Starting at a new school is both exciting and challenging for a child. Our faculty and staff will ensure the comfort of your child. And our vibrant and welcoming student community will ensure a smooth transition of your child to the new school environment. We welcome applications from students of all nationalities who have a willingness to contribute to the school and community. Students who have SEN are not prevented from access when applying to RIS. If any students with these difficulties were to enrol then reasonable adjustments would be made to ensure that their needs were met and that they are fully integrated into the school community. We offer rolling enrolment throughout the year as long as space is available and aim to make the admissions process a pleasant, straightforward experience. Priority is given to residents of Emaar’s communities, students of other educational institutions owned and managed by Fortes Education and to students who have a sibling(s) at the school. Enrolment Age Calculator - Use the age calculator to compute your child’s eligibility for enrolment. We maintain high standards of education and have created a strong and nurturing academic environment for overall growth. Our admissions team will meet you and your child to gather information about your child's previous education. We encourage you to take a tour of our school to get to know our facilities and RIS better. We select our students based on their capability to cope with our academic curriculum and their overall attitude towards learning. We will ask your child to sit through some tests to ascertain his education level. An informal assessment will be held with the child to assess suitability and readiness to start school. Admission of applicants is subject to an interview and successful completion of the School’s Assessment Tests in English and Maths. Where applicable, review of records from the student’s previous school(s) shall be considered. If during the entry assessment, our admissions team feels that your child may benefit from additional language and/or learning support upon entry to the school, they will schedule a second assessment with the Achievement Centre. The purpose of this assessment would be to determine your child’s level of school readiness, and to conduct an assessment of educational need so that we can identify how best to support your child’s successful transition into RIS. Regent International School is currently accepting applications for the academic year 2016 -17 for all year groups from Foundation Stage 1 to Year 6. 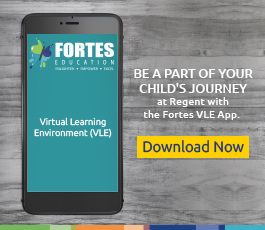 To apply for Regent International School, please fill out our online Application Form and we shall revert back to you. English is the language of instruction at Regent International School (RIS). For Year 2 to 6 students who require support and for whom English is not the first language, RIS provides English language support and remedial classes. ‘Intensive support’ to develop age-appropriate English language skills may also be offered (at the school's option as per the capacity available in the Individual Needs Department). Regent International School’s teacher-student ratio at Foundation Stage 1 (FS1) & Foundation Stage 2 (FS2) is 1:22, and 1:26 for Years 1 to 6. The school retains the right to increase the class size as warranted, for example when students are set by ability for specific subjects. FS1, FS2 and Years 1 to 3 have a Learning Support Assistant assigned to each class. 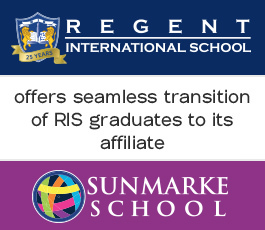 RIS offers guaranteed places to students who graduate from or have completed one academic year at a Fortes school or preschool, which include Sunmarke School and any one of the Jumeirah International Nurseries, respectively. Students receive an offer only after successfully completing RIS's admissions process. At RIS, we exercise a positive, and inclusive admissions policy. We appreciate that every learner is unique, with different aptitudes and abilities. While there is no specific pass mark for the assessment, applicants must demonstrate a level of school readiness which will support successful learning experiences for themselves and their prospective peers in this common learning environment. Students with Special Educational Needs or Disabilities (SEND) will not be refused an offer of placement on the sole basis of their SEND. In considering each application, we will take into account the capacity of the premises, staff and curriculum pathways to effectively meet the needs of the individual.Candidates will each be given due consideration on a case by case basis, in light of the overall dynamics of the cohort at that time.